The maximum emails I get these days is about sun tan. People ask me how to remove sun tan using natural ingredients. So instead of replying to all emails, I thought of doing a separate post on how to remove sun tan quickly. It's super hot in Hyderabad and I feel this is the right time to take good care of skin. If you are a lazy bum then you can always use Biotique Bio Papaya Tan Removal Scrub. It is the best scrub for removing tanning off your skin within few days! Today I am going to share with you my secret grandma natural, homemade recipe that works like a charm on removing sun tan instantly! When we think of summers, vacations come to our and that means spending ample amount of time under sun. Even when you are not planning vacations, summer season do bring sun tanning on skin. The best way to avoid sun tan is to apply sunscreen on exposed skin. make sure you reapply it after every few hours as its effectiveness decreases with time. Though my skin gets hardly tanned but I still remember the time we visited Goa and was BADLY tanned. The tanning was really ugly that it made me freaked out. The home remedy that I going to tell you worked like a charm and removed my sun tan within few weeks! I also shared this DIY with many of my friends and all have seen visible results. This DIY home remedy works! Without wasting time, let's get into the face and body pack that removes sun tanning! Yogurt/curd contains lactic acid that is very good for removing tan and nourishes the skin well! Orange contains vitamin c and natural bleaching agents that makes skin look light. It also gives a visibly brighter skin. Cucumber is a superfood and not only helps in lightening dark circles but effectively removes sun tanning and dark spots off the skin! It is a natural astringent and helps in nourishing and hydrating the skin! - Mix all the three ingredients in a bowl and apply it on clean skin. Let it sit on your skin for 10-15 minutes! Rinse it off with warm and then cold water! Pat off the skin and apply toner and moisturizer of your choice! - Always wash your skin with a face wash before applying any face pack! - Do not allow the mask to sit on your skin for more than 15 minutes! - I use ready made orange peel powder that I bought from Amazon. You can buy from here. You can always make it at your home using orange peels! - Use a good quality rose water to get maximum benefits! - Always use a sunscreen before stepping out in the sun. - Use sun sleeves to protect your hands from getting tanned! - This face pack will suit all skin types! What do you use to remove sun tan? Share with me in the comments section below! How crazy is this I never knew you could remove one! Very good tips for the summer holidays when we plan to travel. Thanks for sharing. The ingredients of the pack are always available in our Indian households. This is very cool. I didn't even know this was possible. This is interesting. Although I never realized you could actually lessen a tan. Great read. I don't think I have ever had a sun tan I didn't like! I'm looking forward to getting a little sun this summer! Great remedy! I'll have to bookmark your page! 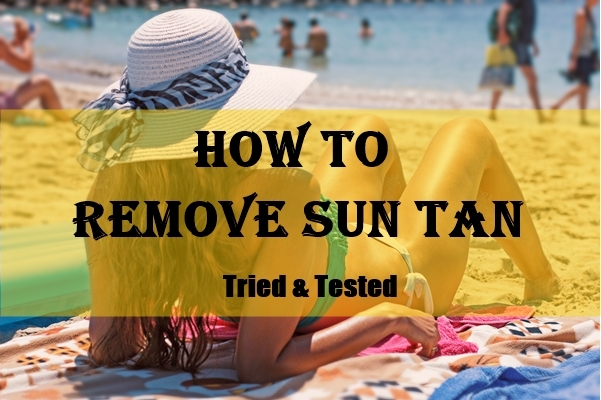 Thank you for this tip on how to remove sun tan. I usually wait until my skin undergoes its natural process but if I could speed it up using natural ingredients, then yes, I will definitely try this! I rarely get tanned, so I probably don't need this particular solution. But I have some friends who could use the information so I'll definitely share it. Cucumber Juice is so effective! I have tried it before. So cool! I rarely get tan (have very pale skin) so this doesn't apply to me. But I have friends who are very tan and I'll share this info with them. How interesting... I had no idea some folks would want to get rid of their tan after spending hours getting it.